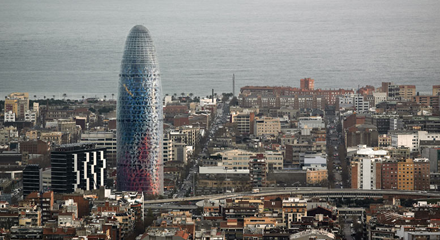 In the last two decades, Barcelona’s skyline has undergone a radical transformation. The Olympic Games in 1992, the Forum of Cultures in 2004 and the development of a new technology district, known as 22@, have precipitated the construction of impressive buildings and skyscrapers, such as the Mapfre Tower, the Hotel Arts, the Telefonica Tower and the Agbar Tower. 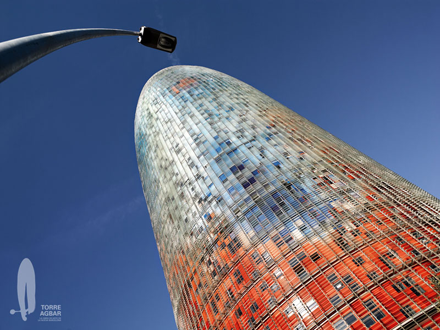 The Agbar Tower was designed by the French architect, Jean Nouvel, and since before it was opened in 2005, it has become the iconic building of new Barcelona. The tower, with its conical oval shape, inspired by Gaudí’s architecture without straight lines and the Montserrat mountain range, its spectacular “skin” of light and colour, 34 floors and 142 m height, represented a genuine revolution in the city’s urban landscape and continues to be marvelled at by Barcelona’s locals. In the Agbar Tower, functionality and design merge with environmentally-friendly building materials and elements that take advantage of climatic and environmental conditions to achieve a significant reduction in energy consumption and improve the quality of life of residents. 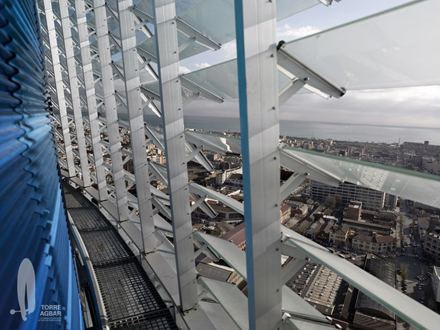 In 2011, the Agbar Tower won the European Commission’s Green Building award for its energy efficiency and low CO² emissions. 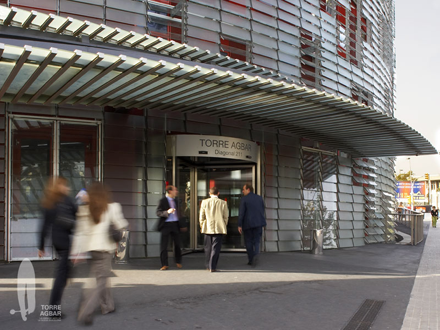 The Agbar Tower is the corporate headquarters of Agbar Group, the main company responsible for supplying drinking water to the city of Barcelona. It is located at Avenida Diagonal 211, next to the Plaza de las Glorias, the gateway to Barcelona’s new technology and business district. This modern area, known as 22@, occupies 200 hectares of the former industrial neighbourhood of Poblenou and accommodates over 1,500 companies involved in new technology, the media, energy and medical research. 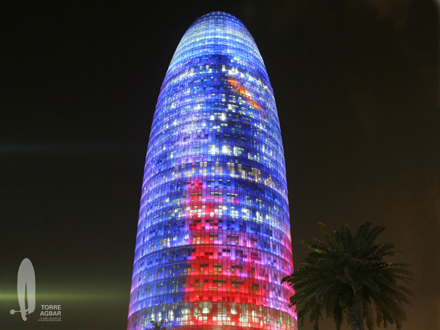 One of the Agbar Tower’s most unique characteristics is its night-time illumination, which is achieved with more than 4,500 LED lights. The system enables more than 16 million colours to be projected, creating stunning images of light and colour on its façade. The tower is illuminated every night from 7:00 pm to 11:00 pm in winter and 9:00 pm to midnight in summer. It is a spectacle that is worth viewing from close up, but is also visible from many parts of the city.